General Conference in Tampa, Fla. A UMNS photo by Mike DuBose. TAMPA, Fla. (UMNS)-Krin Ali was live and Joy Eva Algodon-Bohol was taped, but together the two young United Methodists issued a challenge to their brothers and sisters around the world to be "Charged. Rooted. United." They delivered the Young People's Address April 25 as the worldwide assembly of United Methodists started its second day of business. Algodon-Bohol from Cebu, Philippines, was denied a visa so she could not attend the 2012 United Methodist General Conference in Tampa, Fla. In the end, she gave her speech on giant screens while Ali stood alone on the stage. Algodon-Bohol invited those listening to raise their hands if they were seated next to a young person. Seeing few hands did not surprise Algodon-Bohol or Ali. "Youth are a minority in the church when it comes to decision making," Ali said. Algodon-Bohol, who is the president of the National United Methodist Youth Fellowship in the Philippines, said taking a leadership role in the church was not easy. Her father was not supportive because she had to resign from a good job to be able to participate fully in the church. She said she felt "charged" by God. "At 14 I was elected secretary, at 16 I was elected to the annual conference, and at 20, I became involved on a national level," she said. "Dear mentors, teachers, fathers, mothers &ellipsis; God has charged you to be here," she said. Ali and Algodon-Bohol punctuated their remarks with those three words: charged, rooted, united. Ali said he was rooted in his faith. "The Apostle Paul says, 'Be not conformed to this world, but be transformed by the renewing of your mind.' A true disciple finds that he or she will be transformed through their faith." Do you know your purpose? Ali asked. "Jesus had faith in his disciples like the church has faith in me." God's love unites us all, said Ali. "We must overcome our age differences. I look forward to a cloud of young people at the next General Conference. I hope to see every adult sitting with a young person." In a news conference after their address, Algodon-Bohol joined Ali via Skype. She talked about her many attempts to get a visa and of the people who tried to help her. Bishop Peter Weaver said the issue of visas has been an ongoing problem and noted that many international delegates were denied visas. 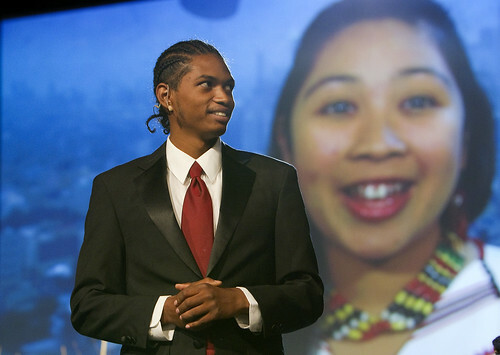 Ali, 18, and a member of Park Hill United Methodist Church in Denver, Colo., said he was honored to be able to speak at the conference and was sad that Algodon-Bohol could not be there. "I felt a warm embrace, and people really seemed to be reflecting on my words." News media contact: Kathy L. Gilbert, Tampa, Fla., (813) 574-4837 (until May 4); after May 4: Nashville, Tenn., (615) 742-5470 or newsdesk@umcom.org.